For us, sustainability is not just about making our operations more sustainable, but to work across our value chain to inculcate the culture of adopting sustainable materials, practices and technologies. 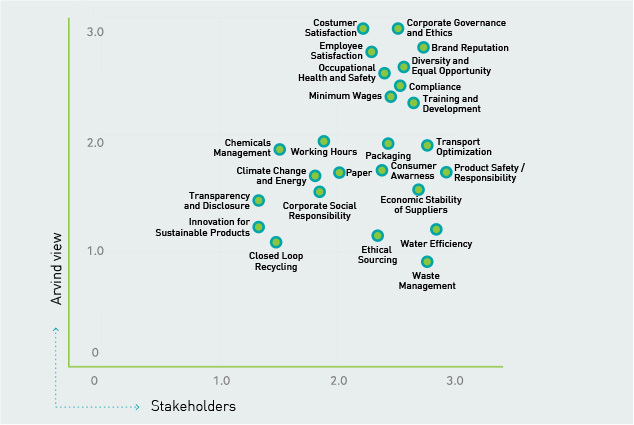 This is because we firmly believe that sustainability will be one of the biggest enablers of business growth in the future for the companies that treat it as an opportunity. This was reaffirmed by our stakeholders during the recently conducted materiality mapping assessment. AFL’s materiality assessment is a systematic process that compiles diverse inside-out and outside-in perspectives from external stakeholders, trend analyses and internal engagement with relevant departments. The assessment involved interaction with our business heads, employees and top management and external stakeholders including customers, investors and vendor partners. The illustrationdepicts depicts issues that are most material to AFL. This will guide our sustainability efforts and enable us to effectively utilize our resources so we can contribute towards a future of sustainable lifestyles.